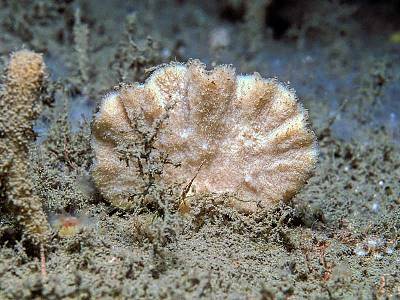 Description: This sponge forms flattened blades attached to the substratum by a small stalk and expanded base. The blades are typically wavy or ridged. The surface has a mealy appearance with small oscules and convergent excurrent channels. 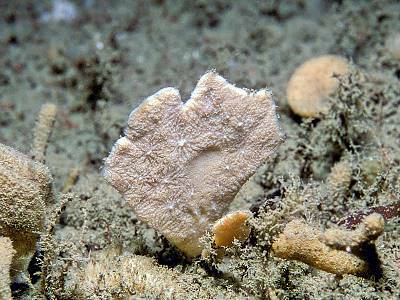 Habitat: Found offshore on open exposed coasts in deep water, usually below 35m. Distribution: Western coasts of Ireland, Aran Islands and Kerry Head shoals. Western English Channel. Similar Species: Very distinctive. On the French coast Endectyon teissieri has a similar flattened form. Picton, B.E. & Morrow, C.C. (2016). Axinella flustra Topsent, 1892. [In] Encyclopedia of Marine Life of Britain and Ireland.